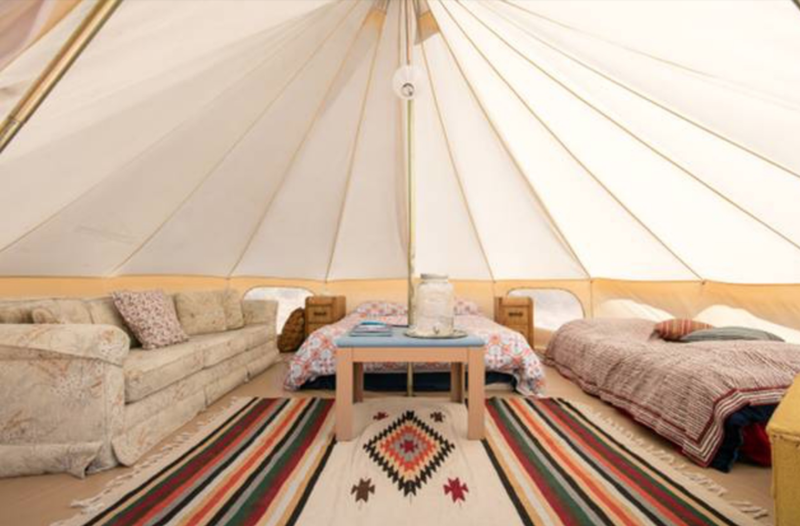 We'll be staying in two different locales during our time together: glamping on private land next to Joshua Tree National Park for three nights and nearby at a multi home ranch in Pioneertown. Desert Yacht Club hosts a variety of Glamping options. From semi-private Yurts, old re-furbished trailers, and airstreams. During our glamping we'll be "roughing" it with open air (yet private) outdoor showers. The restrooms are also setup outdoors, so it's almost like camping, but with say... a glamping focus. The property boasts a pool, lounge area, and access to easy short hikes. Though there is already circulation in the "rooms" the weather can be in the 80's, so a nice cool dip in the pool might come in handy. It is ideal for those who seek inspiration and creativity in a calm and secluded environment. Here you will find sophisticated Italian style in a rustic old west setting, art installations interwoven with the desert landscape, and a unique atmosphere for art production, adventures, and good times in the sunny landscape. Magical desert nights feature a spectacular sky full of stars and moonlight above beautifully lit pathways and expansive desert views. The landscape feels rural, but it is located only 10 minutes to downtown Yucca Valley. There are no other properties in sight of the Desert Yacht Club, which gives us the benefits of absolute privacy and dark night skies which are perfect for stargazing. The camp is rustic and spacious, with a friendly, welcoming atmosphere that creates an easy ambience for total enjoyment. There is a resident black cat called Bippo who roams the camp with nonchalant cattitude, and a rascally roadrunner called Elvis who enjoys looking at himself in the mirror and stealing Bippo's kibbles. Pipes Canyon Lodge is comprised of three lodging facilities with a total of six bedrooms and five bathrooms. The Main house, Guest House and Vintage Guest Trailer. The house sleeps up to twelve guests in three bedrooms and a dorm style suite. Get ready to exhale! That's what guests generally do when they first enter the spacious great room with amazing vaulted ceilings, towering stone fireplace and a mantle built by Pappy (of the famous Pappy & Harriet's restaurant) himself! Outside, sit on the front porch and take in the fifty mile vistas of San Jacinto Mountain, Sawtoothe Mountains, and the Big Bear Mountains. Legendary Black Lava Butte is immediately, and we do mean immediately, adjacent to Pipes Canyon Lodge. Recently referred to as the equivalent to the Vatican in regional native culture. The indoor jacuzzi is situated in our 500 square foot dorm, with it's own fireplace. The house has three bedrooms, a dorm and three full bathrooms. Private, semi-private, and shared rooms are options. In addition to the Pioneer house there is a private home walking distance from the main house. This house has 3 private rooms and one pullout couch as an option. This house, too, has a hot tub as well as a swimming pool, so don't worry. There are more opportunities to take a cool swim to get out of the heat. We offer a wide range of accommodations for every budget and travel style. From group bunking, to a total private experience the perfect adventure awaits! Please feel free to contact us with any questions and we will help you select your ideal getaway.